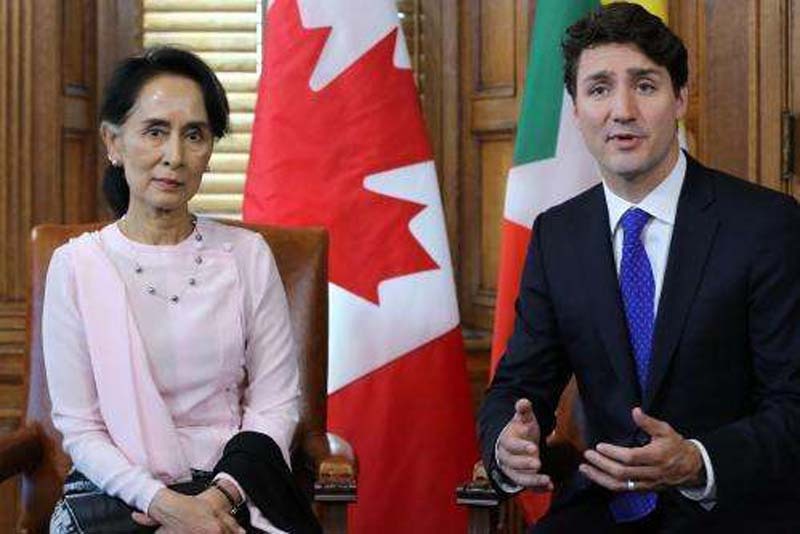 Canada’s parliament voted on Thursday to take away the honorary citizenship of Myanmar leader Aung San Suu Kyi after her failure to act on the Rohingya crisis. “Our government supported this motion in response to her continued failure to speak out against the genocide of the Rohingya, a crime being committed by the military with which she shares power. We will continue to support the Rohingya people through humanitarian assistance, targeted sanctions against Myanmar’s generals and by pushing for accountability for those responsible through an appropriate international body,” Adam Austen, the press secretary to Foreign Affairs Minister Chrystia Freeland said, according to German broadcaster Deutsche Welle. Canada granted honorary citizenship to the Nobel Peace Prize–winning leader—one of six people to receive the distinction—in 2007 for spending years under house arrest while fighting for democracy. “Parliament granted her citizenship, Parliament can take it away. But we’re focused on helping the millions of people who are suffering either in place or as refugees,” Prime Minister Justin Trudeau said, according to the CBC, explaining that the move alone would not help the Rohingya. Parliamentarians voted last week to officially declare the Rohingya people’s treatment as genocide, urging the United Nations Security Council to take the case to International Criminal Court. “I want to underscore how tragic, how horrific, the crimes against the Rohingya are. We are leading an international effort for justice and accountability for the Rohingya. Today’s unanimous motion is a very important step in that effort,” the foreign affairs minister said. Politicians cited a 440-page report released by a U.N. fact-finding mission that detailed the actions taken by the Tatmadaw, the Burmese name for Myanmar’s military. “Peace will not be achieved while the Tatmadaw remains above the law,” Marzuki Darusman, the chair of the fact-finding mission, said in a statement released earlier this month. “The full findings we are releasing today show why, in our report to the Human Rights Council, we insist that the perpetrators of the gross human rights violations and international crimes committed in Rakhine, Kachin and Shan States must not go unpunished,” said Darusman.